As a Mom, I treasure my time alone. I admit it. Sometimes I need a break from the family. But my favorite alone time indulgence is heading to a spa. There are no distractions or emergencies to distract from the peace and quiet. It’s my refuge, a place I can go alone or with the girls to just leave everything behind. Close my eyes, relax, and recharge. When I visit Disney it has become a tradition for me to time to visit the Disney spas, but what about at home? You would be amazed at the oasis’ of tranquility that are right in your back yard. All you have to do is look. In the Houston area there is a diamond in the rough that can be used as a day experience or a weekend with the girls. It’s the Woodland Resort and Conference Center. Don’t let the word Conference Center in the title scare you off – this resort has a wonderful resort offering. You can tell that the resort is in a state of change as much of the resort looks quite corporate but if you dig a little deeper you will discover so much more. There are wonderful pools to lounge by. A family oriented Forest Oasis Waterscape pool complete with a 30-foot Forest Tower water slide, Puffy’s Sprayground spash pad, and waterfall. There is also a lagoon pool closer to the spa and fitness center that is more adult oriented. In addition to the pools there are also trails to walk or bike along, two championship golf courses to play, and of course there is the spa. They are also growing the resort side with a $60 million expansion that includes new accommodations and a 1,000 foot lazy river, and restaurant to open later this year. Did I mention the spa? This is what I recommend going there for. They have a Nature Best Spa Package that includes 2 spa treatments, a one night stay, and a breakfast buffet. My sister and I took advantage of this resort package and we have decided it may need to be regular occurrence. We both had Refresher Facials and a 50 minute Swedish massage. I don’t think I could speak higher of the spa attendants. They listened to what you wanted and executed perfectly. I have had many messages and this ranked highly on my list. 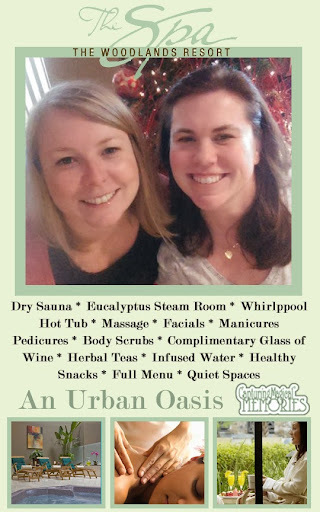 We both have been to many spas and were pleasantly surprised at how trained they were. But what I loved most about the spa area was the number of nooks and crannies to hide in. They had corners for reading, sitting by or in the hot tub, and even an area with a roaring fire. Wherever you lounge you will be offered a complimentary glass of wine to completely unwind. They are also happy to cater to any need you have. We were told it was no problem to have lunch/dinner ordered to the spa and there was no rush to leave. You easily could spend 4-6 hours here indulging yourself. For dinner you can eat on property or head over to the Woodland Market Street for dinner and shopping. This area is full of trendy restaurants and shops. You can eat on one of the many patios and enjoy some wine while people watching. This area can easily take you into the evening. The hotel is happy to arrange transportation for you since it is so close so I recommend letting them do the driving. When you wake up the next morning head down to the Woodland Dining Room for probably one of the best buffets breakfasts I have ever had. They call it the Grand Breakfast and they are not kidding. They had homemade granola, fresh cream, Eggs Benedict, a pancake bar, an omelet station, etc. etc. And before you begin try the fresh made banana bread they bring to the table. You will be stuffed! So enjoy the view of the 200 acre lake, relax, and enjoy an extra cup of coffee before you head home. Take in look in your area for these hidden gems to get away for some solo or girl time. But if you are in the Houston area I would definitely recommend the Woodland Resort and Conference Center. I know I will be back. FTC Disclosure: I have NOT been compensated to share my opinions on this resort. I was provided with a spa package weekend free of charge for Editorial Consideration . However, all opinions are 100% my own. I am disclosing this in accordance with the Federal Trade Commission 16 CFR, Part 255 – Guides Concerning the use of endorsements and testimonials in advertising, you may visit our full disclosure page for complete policy information. What a great looking and sounding place! To answer your question, with 5 little kids at home I recharge by crawling into my bed at 8pm, LOL! I’d love to visit this resort, though! Lookes like a nice place to stay, to have fun and to work! Wow! That looks SO relaxing! I’m going to HAVE to go to spa one day soon. What a beautiful place to stay at. The pool looks amazing. I can’t wait for an oasis of tranquility! Can’t wait for our vacation. Should be something like this! We need one of those in my area of NY.. Looks like i could use some time..
HeidiPortzlineStrawser Yes, I need to go back. kungphoo1 I am sure there is something equivalent. You just have to look. Oh wow i could totally use this right now! I want to go there! Wow, this place looks and sounds amazing!! I love Disney, but I’ve never been to one of the spas. It sounds (and looks) incredibly relaxing! I’ve also been known to hide out in the bathroom, hahah. Disney and a spa? I didn’t even know! Perhaps when we save up – I would love to try this!! Lol. This isn’t a Disney spa. This is one a bit closer to my home in Houston. But Disney does have GREAT spas. Highly recommend trying one after a couple of days touring the parks. It sounds like heaven. I will have to add it to my to go list. I love my alone time too and let me tell you, this looks like the perfect place for alone time. Sounds like a fantastic place to stay. I sure wish I was there now..it is 10 degrees in Wisconsin and we are expecting 4 – 6 inches of new snow! Woodland looks like a dream to me! My friends and I do Girls Weekend every year and try to go to a new city each time. We haven’t made it to Houston yet so I’ll have to keep this place in mind. Glad you reviewed it because the conference center part definitely would have scared me off. Sounds like a great place to relax and recharge your batteries. Something I really would like to do myself. This sounds wonderful! I would love to indulge at a spa like this. I know they exist, especially in Phoenix and Scottsdale. I’m going to have to look into it. Thanks for the inspiration. I recharge at home with some proper me time. Whether that’s watching a movie, knitting, or reading alone. Or pampering myself. That resort looks amazing. tinasue1379 Some of the best spas I have ever been to are in your area!!! They are magical. 17sirens I wish I could get proper me time at home. I am quite jealous. And I love the knitting. I crochet (not talented enough for knitting) and also believe it is very calming. This looks like such a great place to relax and enjoy! I definitely will be looking into it! Mary, the spa sounds lovely! I recharge at home by pouring myself a glass of wine and putting my feet up! 🙂 Visiting from the Sweet Tea Social- have a great week!